Shortly after I posted the first episode in this little mini-series on leaving SharePoint, Christophe a.k.a. 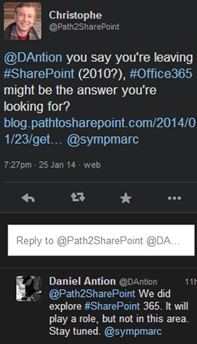 @PathToSharePoint suggested that Office 365 might be the answer to the problems we are having. I responded, telling him SharePoint 365, sorry SharePoint Online will have a role in our future, just not this role. It is as if SharePoint Online had shown up for an audition, missed the lead role but got picked up as an extra on a different film. Hey, that’s show-biz. The reason we looked at SharePoint Online was because we thought it would be easy. In some ways, it would be easy. Unfortunately, the ways in which it would be easy are the ways it would be easy for us. We already know SharePoint, so working with SharePoint in the cloud would be a snap. We already have the content organized in SharePoint so moving it to the cloud would be a snap. We already own MetaVis, so moving our on-premises SharePoint stuff into the cloud would be…what’s the word for a snappier snap…let’s say easy-peasy. The problem is that we’re supposed to be making life easier for our customers. How does that work for me? That’s the thing with business problems, the solutions are spread across a spectrum of benefit. If we can’t have the whole rainbow, we have to focus on our members and our customers first. The big reason SharePoint Online would be easy is because we are going to use it for a part of our normal business process. We have some stuff in SharePoint on premises that requires high availability. Specifically, it needs to be available when our office is without power. We don’t have any redundant power options, so we have to create redundant content. The content is in SharePoint, the redundant content will be in SharePoint online, done. That works really well, but again, it works for us. There are ways to make it easy for our domain users to log into SharePoint in the cloud, but our customers aren’t in our domain. In order to get them to login, they would have to have some sort of Microsoft account. As far as Microsoft is concerned, this isn’t an issue because everybody either has or can have a Microsoft account. Yeah, but that’s not really the case. Some people don’t have an account. Some of those people don’t want one. Some people have a Microsoft account, but it isn’t associated with their job. I had to create a Microsoft account in order to work with an association I belong to. As an old boss used to say: “the process was 1, 2, 6;” in other words, a snap. I don’t use this account very often, but whenever I do, my first task is to delete about 100 pieces of junk mail. This is the last thing I want our customers to have to do in order to work with us. In addition, for security reasons, some of our customers are prevented from using personal credentials to access content while at work and others are prevented from creating such an account that is linked to their domain email address. In our on premises implementation, we had a separate domain and we issued credentials when necessary. Moving to the cloud seemed like a step backward as far as user experience goes. Finally, in addition to all of the above, if we did go with SharePoint Online as a solution, our content would be in SharePoint, duh. I you remember the original post in this series, the problem with that is that most of our customers, I’d say 95% of them; simply want to download files from our repository. They don’t want calendars, tasks, blogs, wikis, custom lists, metadata and workflows – just the files. 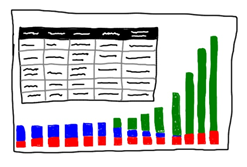 When that’s all they want, you either have to spend time to make SharePoint look less capable than it is, or you are going to make your customers wade through a process that seems overly complex. If you are a lover of suspense, stop reading. I’m going to spoil the ending of this saga. We have decided to use Citrix ShareFile for this application. I’ll explain why we selected it and how we use/plan to use that service in the final installment of this series. Until then, I can say that we are very excited about it, our employees are very excited about it and the customers we’ve spoken to are very excited about it.